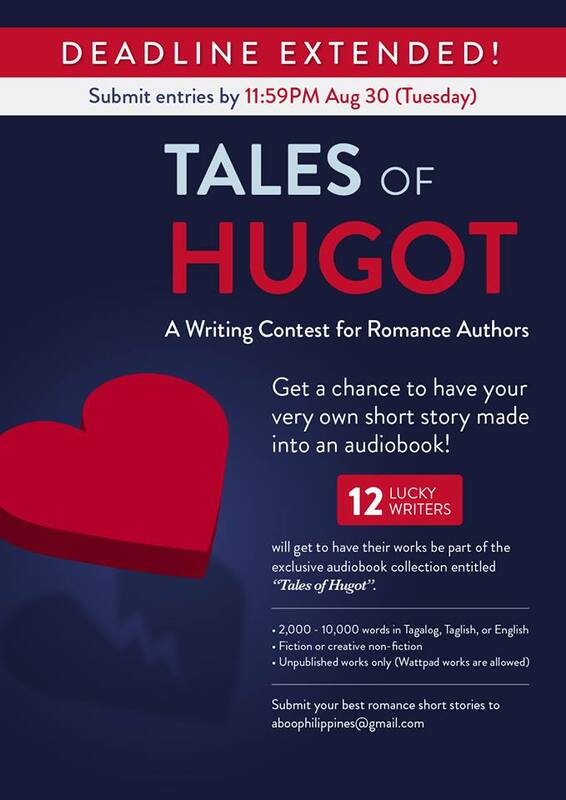 Calling all WattPad and romance authors! Have you ever dreamed of seeing your characters come to life in the form of an audiobook? Well, here's your chance! An audiobook anthology calls for submission dubbed as Tales of Hugot. The 12 best submitted works (short fiction or creative non-fiction) will be selected for inclusion. Theme should revolve around "Hugot" (literally means "to pull out" or "to draw"). But this "hugot" can mean something else. Hugot as a slang word refers to drawing emotions from somewhere deep within you… sort of like being emo. So-called “hugot quotes” (#whogoat) are very popular. Deadline of submission of entries has been extended until August 30, 2016 at 11:59 PM. Selected works will have all costs covered in transforming the work into an audiobook, including the talent fee of voice actors, rental of recording studios, rental of audio equipment, manpower costs of producers and engineers, licensing of music and sound effects, and online advertisements. Authors will retain all rights to their work, except audio rights (which are necessary to record and distribute the work as an audiobook). Authors will also receive standard publishing royalties from all physical or digital copies of the audiobook sold. Works must be between 2,000 and 10,000 words. Language must be in Tagalog, Taglish (Tagalog & English), or English. Interested applicants should send their best short story or creative non-fiction (essay) about hugot to aboophilippines@gmail.com by August 19, 2016 (Friday) August 30, 2016 (Tuesday). Winners will be contacted via email by August 26, 2016 (Friday) after about a week or so. Tip: If you have a large following on WattPad, Twitter, Facebook, or another social media platform, please note so in your email, including your username accounts.